See Candler's website for additional conference details and registration. 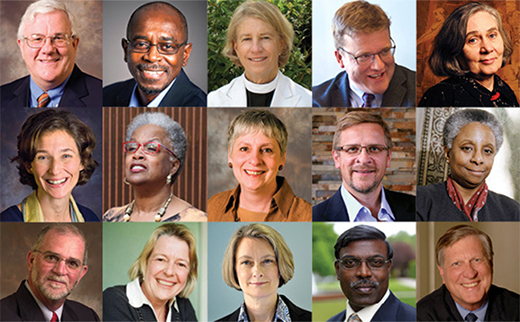 Some of the best minds in theological education are gathering at Emory University’s Candler School of Theology this month to consider the future of pressing theological issues facing the world. As part of Candler’s yearlong Centennial Celebration, the school is hosting a forward-looking academic conference, “Prophetic Voices: Confronting Theological Challenges of the Next Century,” March 18-20. Registration ends March 9. “Prophetic Voices” brings together a dozen renowned theologians from Candler and beyond, including Pulitzer Prize-winning author Marilynne Robinson (author of "Gilead" and "Lila"); Janet Soskice, chair of the faculty of divinity at the University of Cambridge; and ecologist Norman Wirzba of The Divinity School at Duke University, among others. The conference is co-sponsored by the McDonald Agape Foundation. Despite the common definition of the word "prophecy" as forecasting the future, conference organizer and Candler professor Luke Timothy Johnson explains that this event is not an exercise in prognostication, but in truth-telling. The kingdom of God and global pluralism. Jehu J. Hanciles, D.W. and Ruth Brooks Associate Professor of World Christianity, who will examine elements of global pluralism and its expanding religious dimensions, including its implications for western theological education in the 21st century. Daniel Jeyaraj, Liverpool Hope University. Candler faculty members Elizabeth M. Bounds, Ian A. McFarland, Jonathan Strom and Elizabeth Corrie will serve as moderators. Thomas G. Long, Bandy Professor of Preaching, and Teresa L. Fry Brown, professor of homiletics, will preach at two worship services during the conference. The conference themes were carefully crafted by Candler’s Centennial Committee and are being integrated into classroom instruction at Candler throughout the school year. During the conference, students will gather in formal discussion groups with faculty to reflect on the ideas being presented. “These four themes were identified as issues that are distinctive to our age in a way that they weren’t when Candler was founded 100 years ago,” says Johnson. And the hope is that “Prophetic Voices” will encourage dialogue about these themes far beyond the walls of Candler, long after the conference has ended. “Prophetic Voices” is designed for theologians and church leaders who want to engage in conversation with renowned scholars and activists about the critical issues facing the future of theology and theological education. The Honorable Alonzo L. McDonald founded the McDonald Agape Foundation to encourage distinguished scholars and scholarship for Jesus Christ. Prior to forming the Foundation, he enjoyed distinguished careers in business, government, and academia. An alumnus of Emory College, McDonald served for many years on the Board of Trustees of Emory University.